KIEV, Ukraine -- As thousands of demonstrators continued to occupy central Kiev despite all his concessions, President Viktor Yanukovych said that he was temporarily retreating from the scene. 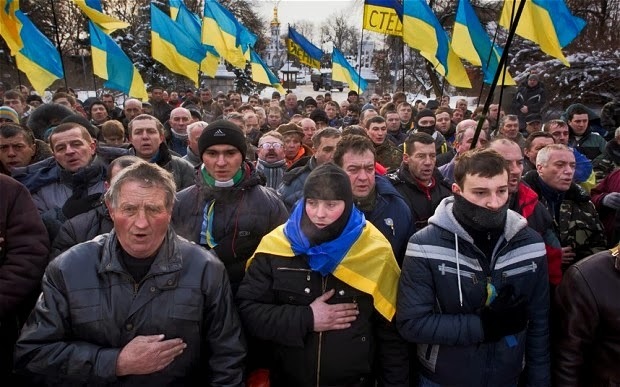 Protesters, some from right-wing groups, sing the national anthem in the city centre of Kiev. The 63-year-old was “officially registered as sick” with a “high temperature”, said an official statement on Thursday. It was unclear when he would return to his desk. As a parting shot, the president released a written address, declaring that his government had done all it could to end the demonstrations and “fulfilled all its obligations”. Critics suspect that Mr Yanukovych’s illness is a device to relieve him of any further meetings with the opposition. His latest concession was an amnesty for the protesters, which Parliament passed on Wednesday. By insisting that he has kept every obligation, the president’s statement suggested that he would not retreat any further. But the demonstrators in Independence Square are determined to continue until he resigns. ”The end of the protests will be when Yanukovych leaves because his hands are bloody now,” said one 19-year-old who gave his name as Yaroslav. On Wednesday EU foreign policy chief Catherine Ashton said after meeting Mr Yanukovych that it was time for "real dialogue" to start and for "the violence and intimidation" to stop. In a move that is likely to complicate matters further, Russian President Vladimir Putin said that Moscow would wait until a new government is formed in Ukraine before it considers releasing a crucial $15 billion bailout package for Kiev in full. Analysts say the Kremlin may back out of the deal if it saw a staunchly anti-Russian government come to power in Ukraine, and the EU may end up having to bail out the former Soviet nation. Three activists were shot dead in clashes in Kiev last week, but tensions have calmed somewhat since negotiations between the government and the opposition gained traction. However, there still appears to be no easy way out of a crisis which will influence the future orientation of the nation of 46 million people sandwiched between Russia and the EU. Mr Putin on Wednesday discussed the crisis with German Chancellor Angela Merkel, the Kremlin said, stressing that "any outside interference is unacceptable." Mrs Merkel for her part told Putin to push for a "constructive dialogue" to defuse the crisis in Ukraine, her office said. Protesters, some from right-wing groups, remained camped out in much of the city centre of Kiev and have now erected wooden watchtowers at their barricades. They are still occupying key municipal buildings including the Kiev city hall. Underlining the gravity of the crisis, Leonid Kravchuk, Ukraine's first post-independence president, on Wednesday warned that the country was "on the brink of civil war". "It is a revolution. It is a dramatic situation in which we must act with the greatest responsibility," said Mr Kravchuk, who was president from 1991 to 1994. The opposition did not vote for the amnesty bill as it is unhappy that the law is conditional on protestors vacating buildings they have occupied in Kiev. The majority Regions Party backed the law after a rare closed-door meeting at parliament with Mr Yanukovych, who reportedly threatened early parliamentary elections if they did not support it. A total of 232 deputies voted for the bill and 11 against, but 173 MPs present in the parliament did not vote. The amnesty will only be enforced after the Prosecutor-General confirms protesters have left all government buildings across the country. Svoboda (Freedom) party leader Oleg Tyagnybok said that parliament had essentially adopted a law about "hostages" as the dozens arrested during the crisis would now be held until buildings are freed. "The authorities have now admitted they take hostages like terrorists do, so that they can then barter over them," he was quoted as saying. "Don't believe that the opposition will give up the Maidan," he said, referring to Kiev's Independence Square at the heart of the protests. "Instead of lowering the temperature in society, this is going to raise it." Dozens of activists have been arrested since clashes broke out January 19, both in Kiev and in the provinces, where activists have stormed regional administration buildings. Mr Azarov and his entire government resigned on Tuesday after weeks of protests that began when Mr Yanukovych pulled out of a key EU deal in favour of closer ties with Moscow in November. In the biggest concessions to the opposition so far, parliament on Tuesday also scrapped anti-protest laws which had ignited the current upsurge in tensions when they were passed by parliament on January 16.